One of things that always springs to mind when I hear the word “hope” is the acronym “H.O.P.E.” which, in this case, stands for “Hold On Pain Ends.” While I do hope for my pain to come to an eventual end, it is not the only hope I have. I have spent a lot of time feeling cheated by migraines. It sometimes feels as though they have stolen more than a decade of my life. I was robbed of early adulthood, most of which I spent in bed, doctors’ offices, and emergency rooms. The rest of the time I felt like it was spent trying to make up for lost time, to catch up on what I had missed. I expended a great deal of energy on apologizing for things that weren’t my fault and explaining or defending my illness. It was, in truth, not a great way to live. I was constantly rushing to catch up with everyone else and, in the process, I missed out on the days that I was well enough to enjoy because I wasn’t mentally or emotionally present in the moment. I had a plan for my life and, in my mind, I had to go back and check off each item on my list before I could move forward. Thus, I basically moved backwards most of the time, occasionally staying in the same place, but never really progressing. I couldn’t accept what had happened to me and didn’t know how to cope with it. To me, my life was “supposed” to follow a certain script and, in the absence of that ultimately arbitrary script, I was lost. I had no blueprint or map. No crystal ball. I barely even felt like I had a compass. I didn’t know in which direction I was “supposed” to head, what “should” happen next. That brings me to my greatest hope for this journey, a hope equally as important to me as the eradication of migraine and other headache disorders: I hope that I am able to learn how to stop “should”-ing all over myself. I hope that I am able to spend time enjoying the present and looking forward to the future instead of obsessing over a past that I cannot change. I hope I can learn to let go of how I believe things “should” go and allow myself to accept and even celebrate how things actually are. I hope that I can learn to find joy in each and every day, regardless of how much pain that day may also contain. I hope to turn my struggle into something positive. I hope to educate others and to advocate for myself and my fellow migraineurs. I hope to go back to school, go back to work, get married, and have children. I hope that I can be an inspiration for those who come after me. 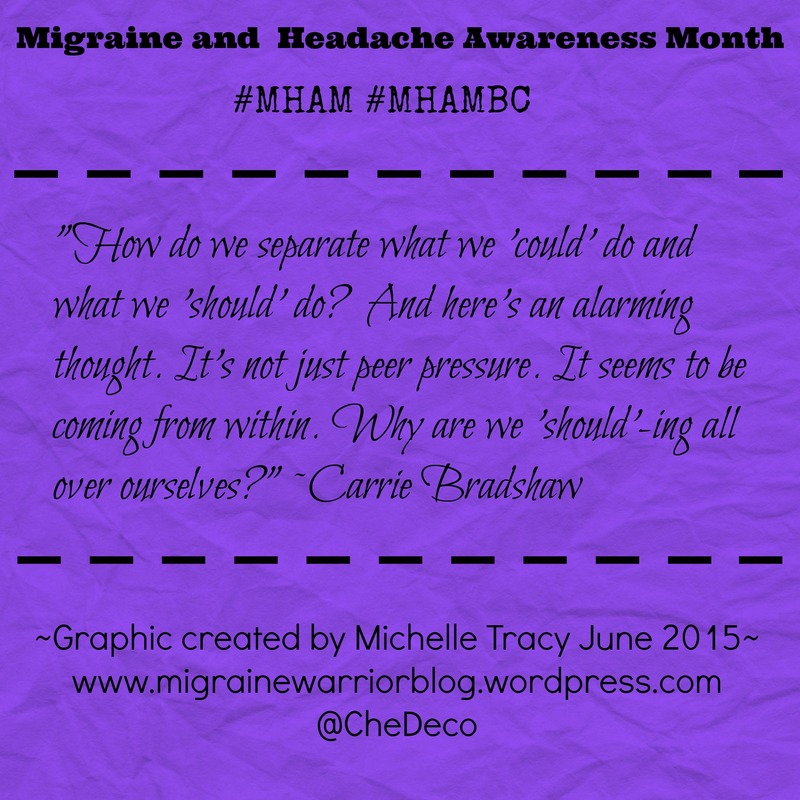 I hope to be a part of the movement that ultimately de-stigmatizes migraine and other headache disorders and eventually finds not only a cure but a way to prevent them from occurring in the first place. I hope that my children and grandchildren won’t have to suffer as I have. Most of all, I hope that this journey has made me stronger and more compassionate, with a greater sense of humor and empathy. Hi. I have had sporadic migraines with auras since I was 12 or 13, and Im 34. I’ve got dealing with it down to a science at this point 😉 but it is still an incredible anxiety for me. I try to never let the fear stop me from doing something, but the fear it is going to happen and I will be somewhere where I can’t deal with it is ALWAYS at the back of my mind. This week I took a position at a kids camp, and I woke up every day with knots in my stomach that one would happen 😦 I went anyway, and loved being there when I was distracted enough to overpower the worrying! It occurred to me that one of the reasons I never became a teacher (I am applying for school right now) is because I didnt think I could… Not with such an unpredictable problem. And that’s how I found you! I cries while I rwad about the construction paper window ordeal.